Fall High Point Market is the industry’s largest home furnishings trade show, with almost 2000 exhibitors. It is full of innovative products and sneak peeks of what’s to come. While there we noticed some trends sticking around and others undergoing transformation. In the color arena, we took note that though beige has been predicted to replace grey as everyone’s favorite neutral, grey isn’t going anywhere soon! Grey finishes and fabrics were a strong presence along with pops of brightly saturated color, like the bright red above. Not surprisingly, rich, dark blues were also frequently spotted. Mid-century modern pieces are still loved and being mixed with maximalism’s extravagance. Detailed large patterned fabrics and wall coverings were combined with clean lines and classic shapes. Oversized furniture and chandeliers met with slick, reflective and patterned finishes. Metal is still having a great day in design, with gold and brass clear winners. A pull towards organic materials and shapes is gaining popularity. We spotted woven wicker and raw wood bases for tables, metal and wood table tops, and beautiful hide covered furniture. Especially cool was an organic hide covered chair from Paul Roberts – the hide is not treated with any chemicals. Innovators are exploring new uses for materials such as using vinyl and wall coverings to cover large furniture pieces, and hair-on-hide lamps. Customization is the new normal – pick the fabric of your furniture, plus the shape and materials of legs and arms as well. One of our favorites is Abner Henry’s selection of wood slabs mixed with any metal. Options in modular design are also on the rise. We loved the versatile chandeliers created out of small 3Form pieces that can be reconfigured to different lengths and Woodbridge’s round table that adjusts to fit 8 or 10 guests with folding panels. We were thrilled to see even more multi-functional pieces too, such as John Richard’s “Fandalier” – ceiling fan + chandelier. Click the image below to view a video of the fandalier in motion! We’re looking forward to seeing what the new year has in store and are excited to use these new options and innovations in designs to create unique spaces that our clients love! 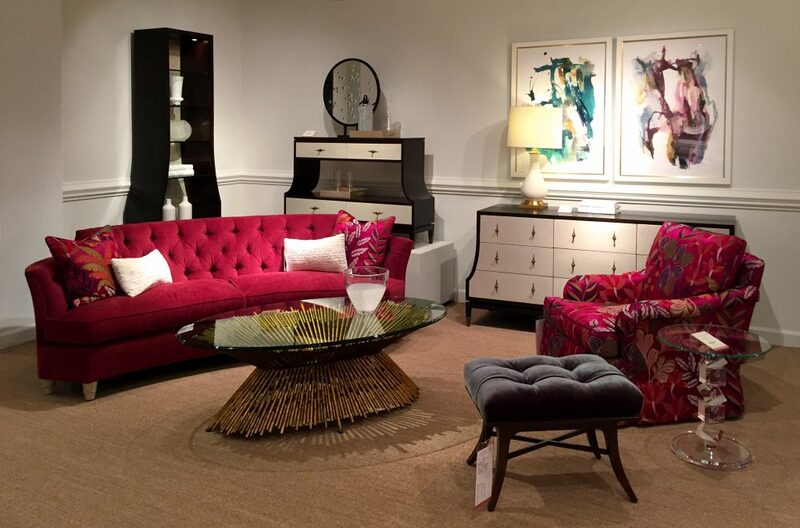 Check out a few of our favorites from Fall High Point Market!